Stephen Colbert discusses the sexual misconduct allegations against his boss, CBS Corp. CEO Leslie Mooves, during 'Late Night,' which airs on the network. 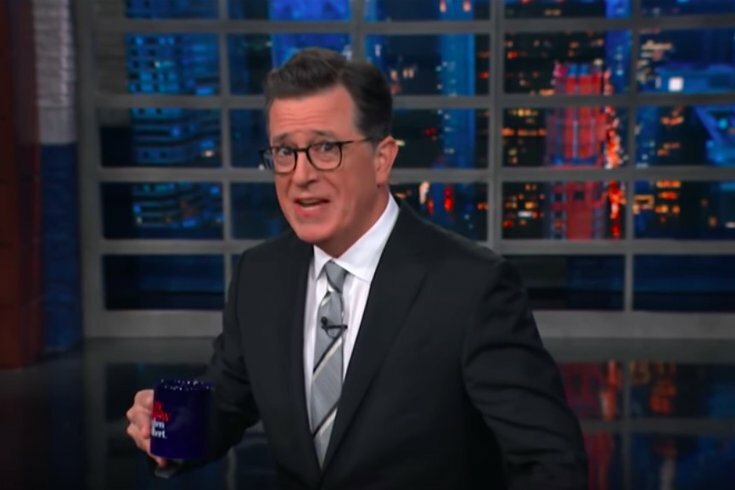 Stephen Colbert began this week's run of the "Late Show" with a spit-take while discussing the sexual assault allegations against CBS Corp. Chairman and CEO Les Moonves. Allegations against Moonves took public attention over the weekend thanks to an article in The New Yorker by Ronan Farrow reporting that six women claim Moonves had forcibly kissed or touched them during professional dealings between the 1980s and late 2000s. Despite Colbert's very own show being run on CBS, the host did not hold back from criticizing his boss after the monologue. "Here's the thing. We're coming up on one year of general awareness of the #MeToo movement, and I think that milestone is worth celebrating," he said. "But it's hard to think of an appropriate anniversary gift when the entire Amazon wishlist is just 'STOP IT!'" He goes on to say, "Powerful men taking sexual advantage of relatively powerless employees are wrong. We know it's wrong now, and we knew it was wrong then." Colbert admitted he doesn't know what will happen to Moonves or the network with this news. "Make no mistake, Les Moonves is my guy. He hired me to sit in this chair. He stood behind this show while we were struggling to find our voice. He gave us the time and resources to succeed, and he has stood by us when people were mad at me, and I like working for him," he said. "But accountability is meaningless unless it's for everybody. Whether it's the leader of a network or the leader of the free world."